Are you eating your way into debt? When you’re looking at where you spend your money, you might be surprised that so much of it is spent on treats, take-away or restaurants. It all adds up! Australians spend on average $200 a week on groceries and around $50 a week on take-away and restaurant meals and another $20 at the bakery - that's $270 a week! A frugal food budget is $15 per week per person (and it can be done - see the $300 a Month Food Challenge over at the Cheapskates Club) while a slightly more luxurious budget is around $25 per week per person. Really want to live it up? Budget for $30 per week per person. Being more prepared in your meal planning and grocery shopping can not only save you money, but it will save your sanity, it will save you time, it will save you energy and it can help to make sure that your family is eating a healthful diet. Creating a meal plan is easy. Really. Start off with a simple plan, one that includes basic meals for the week and a few snacks. When you've mastered the basic meal plan you can get a little more elaborate with more detailed meals (you'll be able to put all those saved recipes to good use at last). 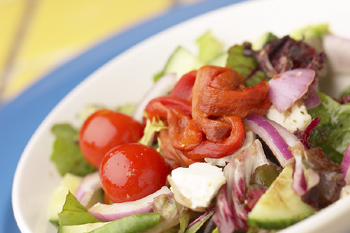 Getting started is simple, just five steps and you'll have a meal plan and a shopping list. Make a master list (either on paper or on your computer) of the meals that your family enjoys eating. To make this job easier, you may want to think of smaller groups of food -- for example, think of meals that you make with mince (beef, chicken, lamb or pork), chicken or other main ingredients. Determine how often you will shop. For example will you shop weekly, every two weeks or monthly? You may find it easier to shop weekly, because that way you can take advantage of weekly store specials, and plan your meals accordingly. I prefer to hit the supermarkets once every four weeks - it takes the same time as a weekly shop, and it is a lot to put away all at once but I don't have the hassle for another 28 days. Just 13 shopping trips a year! 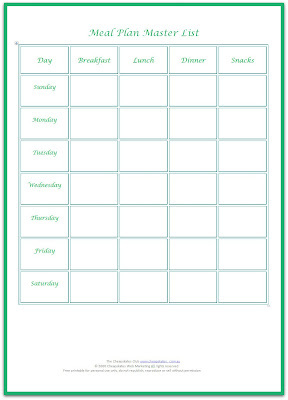 With your list of meals, write down on a sheet of paper what meals your family will eat for your time period. If you do more than a week at a time, you may want to write the actual dates. I also use my grocery store ads at this time, you might like to as well. If I noticed a great deal on chicken, I may purposely plan a dinner with chicken - and visa versa, if no chicken is one sale (and I don't have any in my freezer) we will not be eating chicken that week. I also make sure to not to serve any two "categories" of meals two nights in a row (for example, we won't eat tacos on Monday and burritos on Tuesday). Be sure to look at your family's calendar when deciding what meals to prepare. Because of our schedules with work and other activities, we also have designated meal nights e.g. Tuesday is ‘pasta night' because Wayne doesn't get home until late. Thursday is my busy day, I spend it with Mum, doing shopping and other appointments and Wayne is on call for work so we always have a slow-cooker meal, a stew or casserole that will cope with re-heating. Saturday night is always a light meal and leftover night, we clean out the fridge and everyone gets a little of what ever is left over. I bulk it out with rice, potato or salad depending on the season and what's left over. Next to each meal list the ingredients that you will need to purchase for that meal. If we are having cheeseburgers, I look to see what ingredients I already have and then I list everything else I don't have so I am sure to buy them. Now that you have your meals listed, along with the ingredients that you need to purchase, you are ready to go to the supermarket. Hit that store with a smile, you are on a mission and you have a plan! If you are eating your way into debt, limit the number of times you go out or have take-away every week and start planning your menus when you cook at home. Then shop with a list, and stick to it. This will make a huge difference in your grocery bill. Hi Cath, how do you keep your fruit and veg fresh for a whole month? 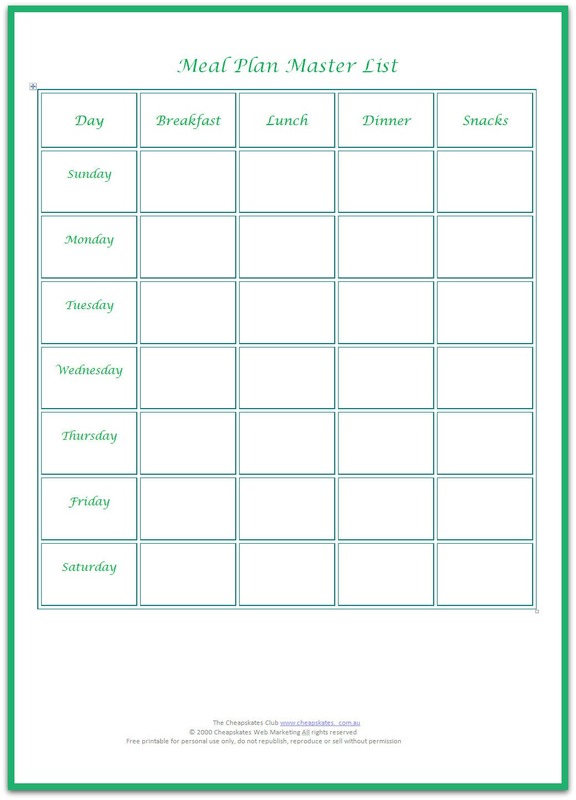 We shop fortnightly and plan to use the salad type things in the first week and the root vegies etc in the second week. Can't see that they would last much longer than that. Would love to hear your tips! Also does the $300 per month include things like nappies/tissues/toilet paper or is it literally just food? I use Tupperware veggie containers and gel bags. Veggies are prepped before they go into the containers. If you are buying fresh fruit and veg it will keep at least three weeks - it may be a little limp by then but still usable. We are so used to the supermarket fruit and veg that has been in cold storage, sometimes for up to 18 months, that we believe produce doesn't keep longer than a week. Fresh produce will keep for ages if it is stored properly. Susan, the $300 includes tissues, toliet paper, basic cleaning products, basic toiletries and a few odds and sods for around the house like coathangers, moth balls etc. When my girls were toddlers I spent $80 a fortnight which included baby formula, a few jars of baby food and nappies. I had my girls in cloth during the day and disposable at night and for going out. I must admit, this was 12 - 13 years ago but I was always able to stick to the $80 a fortnight.